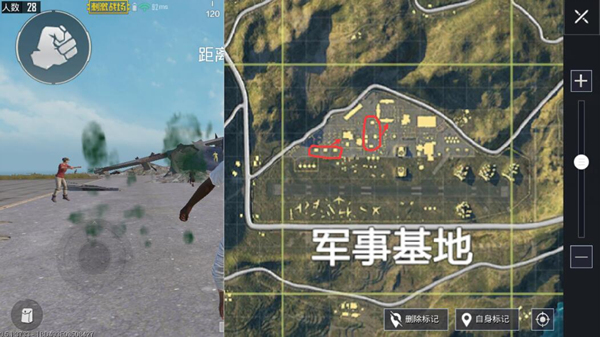 The military base in “PUBG Mobile: Stimulating the Battlefield” has always been a priority for steel gun gods players. And the surrounding enemies once found military bases Some people often choose to turn on when the second security zone is refreshed “Blocked Bridge Charge” mode. What are the reasons for this? Because people who come out of military bases are basically “big rich” people. Of course material rich, you have to have live out skills not? And the conventional way has been known by too many players, and today we talk about different ways of playing at the airport. In general, regardless of the player who is a cricket or steel gun , the base of the military base is nothing more than the following areas: Elevated, C buildings, K buildings, and relatively independent boiler and satellite buildings. As for the choice of a place to stay, here we will use different ideas from the above. Here we will start from a position where there is very little player attention, as shown in the following diagram “Small Five” . This kind of building is simple in structure and has few supplies. Especially in the early days of skydiving, many players would like to start from the most fertile resources. In general, such areas will be ignored by the general public. Although individual materials are not particularly rich, they do not add up. The same. Under normal circumstances, whether it is jumping next to the “small five” C building or jumping “KA” next to the “primary”, as long as these few small buildings touch again, basically no guns will not appear. The worst is a submachine gun. The advantage is that the terrain is concise and the field of vision is better. You can have a quicker understanding of the surrounding situation. Followed by a small degree of attention, the great chance will not encounter landing into a box. Selecting these two points generally does not attract much attention unless you encounter an elevated position. The person who died. Of course, at this time, even if you were beaten by an elevated person, do not shoot back. All you need to do is to subdue. Don’t use steel guns before the equipment is formed. Elevated people can shoot but can attract the attention of other targets around them. You can try to touch several adjacent areas enemy . If it is from “Little Three” “Starting, it goes without saying that the trend is to touch near the “KA” building. If you start from the “Little Five” then you can directly touch the south side of the C building through the nearest house from the “C” building. When cleaning the C building, you need to pay attention to the enemies that come from the boiler room and the “K building” next to it. In general, there is little chance of a military base circle. If it is a military rim, then you can choose to continue to guard in the C building to clear up enemies that have been touched in other directions. If it is not a safe area, you need to walk. Then we need to consider whether it will be blocked. In general, if the bridgehead is in the safe zone, you may consider crossing the bridge. Enemies that encounter blocking bridges also have room to fight. You can fight drugs by dropping blood. Don’t worry about the next circle being out of the loop due to being blocked. blood. If the bridge and even the bridge are not located in the safe area, it is recommended to choose to go the waterway, swimming and sailing can be, in short, do not cross the bridge. Don’t be afraid of ten thousand if you are afraid. Because it is believed that many players have experienced the pain that was killed outside the poisonous circle.